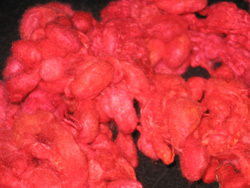 The odd-looking things in this picture are degummed silk cocoons (of 'mulberry' silk: Bombyx mori), dyed in a beautiful array of reds and oranges and cheerful tangled together. You can spin directly from the cocoons. It's my newest quiet passion. It's very simple. Cocoons degummed this way are very soft, and with just a bit of gentle teasing, they let go their cocoon form and become a pleasant mass of silk. 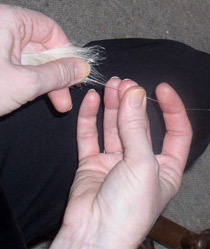 There's no need to card or comb; you can draft directly from the tiny silk mass. And it's lovely! The fibres in the cocoons have shifted in the degumming and dyeing processes, and some have been broken; which means the fibre lengths vary quite a lot. 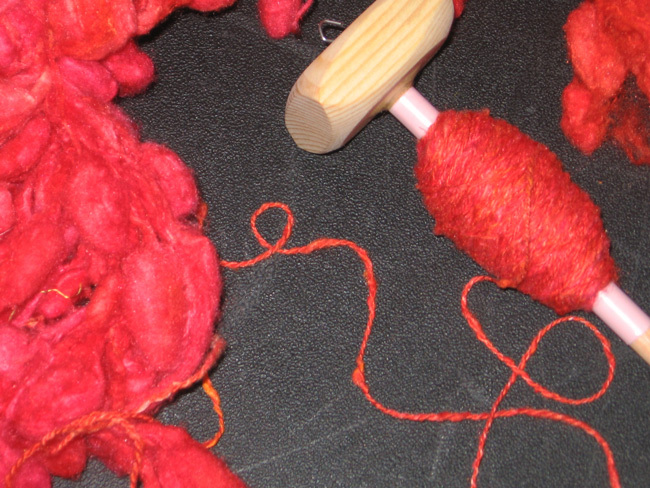 In addition, because the source here is really and truly a cocoon, you can count on a certain amount of neppy debris -- perfect for just a touch of texture in the yarn. I love it! 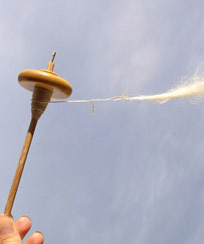 It's especially suited to spindle spinning, and the variations in the fibre require a certain amount of attention during the spinning. For my tastes, that's absolutely perfect. And what of the yarn?? It's lightweight, textured, supple and perfectly viable. 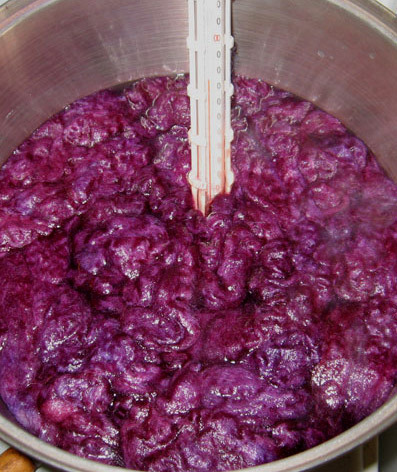 It has an interesting mix of sheen and matte areas, and I think it's going to be a pure delight to use. When you're going on an extended visit, it's important to take along fibre and yarn to keep you grounded, or sane, or in touch with the tactile world -- or in any case to keep your hands happily engaged in the creation of New Stuff. This photo (left) was taken a few days before my departure and shows one 'travel' warp in the process of being wound -- but the thing I wanted to talk about right now was the warping board. It did not come with me, and I'm sorry that it stayed behind. 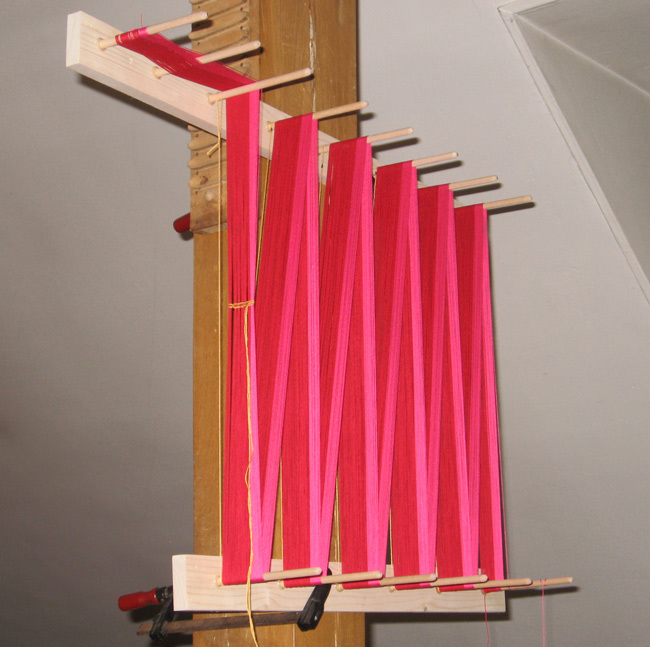 This warping board is another Necessity Invention. 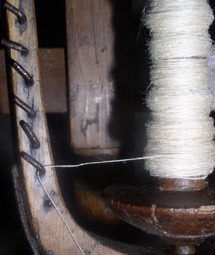 My living room in France contains two large upright pillars, and for years now I've used them as supports for winding warps: a warping peg clamped to one, and a small series of pegs clamped to the other to let me wind the cross. The pillars are almost exactly three meters apart. For short warps (and braiding warps), it's been grand. Just before my departure, though, I wanted to quickly wind several warps, each 5 meters long -- warps for travel, warps for the suitcase. Five meters was longer than was comfortable with my usual method. I needed a solution! This one works well. 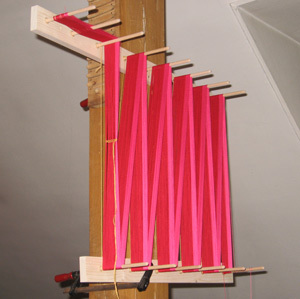 The two racks of pegs can be clamped any distance apart on the pillar, so I can wind a warp of almost any length I please. Nothing connects the two rows of pegs, other than the pillar they're clamped to. After use, they're just a couple of boards full of pegs, and they slip easily and discreetly behind a bookcase for storage. Does this look like a family visit or what?? Yes, it's true: I'm visiting. 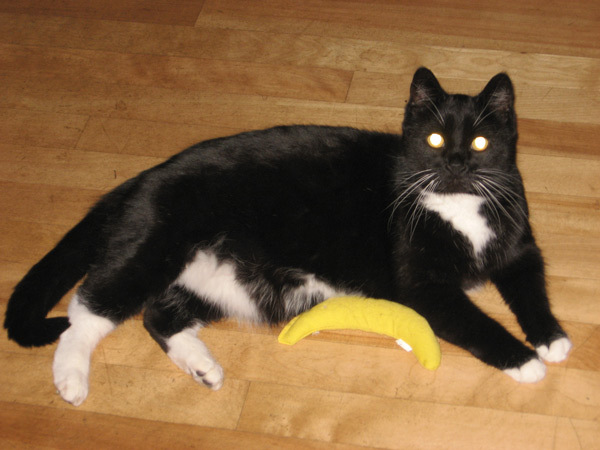 This is my niece, reclining with her best banana and no longer puzzled by the odd comments of her out-of-town aunt. It's been a busy time. 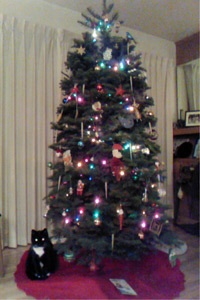 First we had a tree with lights and fascinating dangly bits, which she enjoyed (who knew that you could drink from a tree-shaded pond right inside the house???). People came and went, and the kitchen was full of noise and interesting smells. Then the new year dawned, and all returned to normal. She has resumed her role as Most Powerful Being at the exact center of the Universe. So all is well. It's late to comment on this, I know -- but I'm still here on this visit, so it must still be the season. 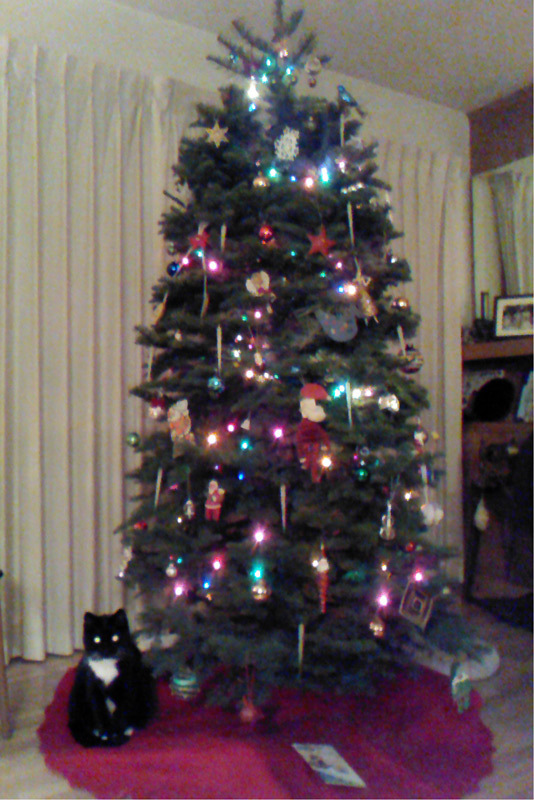 The thing is this: Christmas trees are time-travel devices. Their branches are trimmed with memories and garlanded with intertwined lives. There's real magic in it. When the tree is fresh and new, the memories come out to join it. On our tree you could find a paper-and-cotton Santa with folded-paper legs made by my sister in grade school. You could also see the paper bird made by my nephew when he was three, and a wildly variegated God's-eye that I made in Brownies (how could that yarn possibly survive this long??). There were a few delicate glass ornaments from the late 1940s or early '50s (early in the folks' married life), so light and fragile that we stopped breathing for a moment while handling them. And there was the greeting-card Santa (printed in colour!) that my mother's mother sent my brother in 1946 -- when he was just two and the world was a big Unknown. The hubbub may last a few weeks, but it's just a moment. After everyone has left and the house is again quiet, the tree gets un-trimmed -- and it bestows another kind of magic. Memories get revisited and honored as each ornament is wrapped in tissue and tucked into a box. As the thoughts dance over the past, they turn ever-so-gently toward the future -- they can't help it. It's thinking without thinking, the best kind. We are created and shaped by our past -- the highs and lows, the conflicts and the love -- and we carry that with us into the future. All of us. We spring from the same source, we reflect all we have lived, our lives are intertwined, and we are unique. I lift my teacup to absent friends. Are you looking for something that used to be on this page? Take a stroll through the Archives!